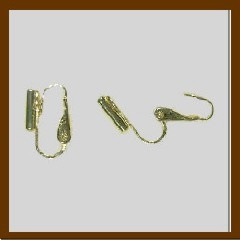 Earring Converters - 2 pair - Luc-Co, Inc.
You don't have to pierce your ears to wear fashion styles! Now you can convert post pierced earrings into clip-ons - in seconds. You simply insert posts directly into the cylinder, then clip onto your earlobe. You'll be able to wear your favorite gemstone buttons, dramatic drop style designs, elegant hoops - without having to put a hole through your ear! Reuasable: just remove from cylinder to change styles. For use with all post pierced earrings; will not convert wire designs. A terrific idea!